Nelken, Anniko and Wilkie. Get scrubbing. Harry Nelken had a knife held to his head when when he drove cab. Rylan Wilkie spent a month phoning Americans to ask their opinions on a tax. Tom Anniko gutted chickens on an assembly line, snagging the occasional rotten bird loaded with an partially developed egg. Those were the worst jobs of the main cast of The Dishwashers, Prairie Theatre Exchange's upcoming comedy, which follows a ruined stock trader into a subterranean dish pit In the bowels of the restaurant where he used to eat, Emmett's soul stares into the abyss - a future scraping endlessly re-dirtied dishes. Or is it hell? His coworkers, head dishwasher Dressler and pit-lifer Moss, both embrace their roles as necessary cogs in the dining machine. They don't look for anything bigger. As Dressler says, "Ambition is a dream you wake up from in the last moment of your life." Canadian author Morris Panych dedicated the play to his father, a man who worked menial jobs his whole life without complaint. In service industry heavy Winnipeg, it's a fair bet some audience members will see their own lives played out on stage. The plays’ existential question – is a menial existence worth living? – may be presented hilariously (In one scene, two dishwashers debate letting the third drown in a plate of mashed potatoes and decide no, he shouldn’t get so lucky), but the struggle between ambition and settling for present circumstances have the cast seriously reflecting on their own lives. 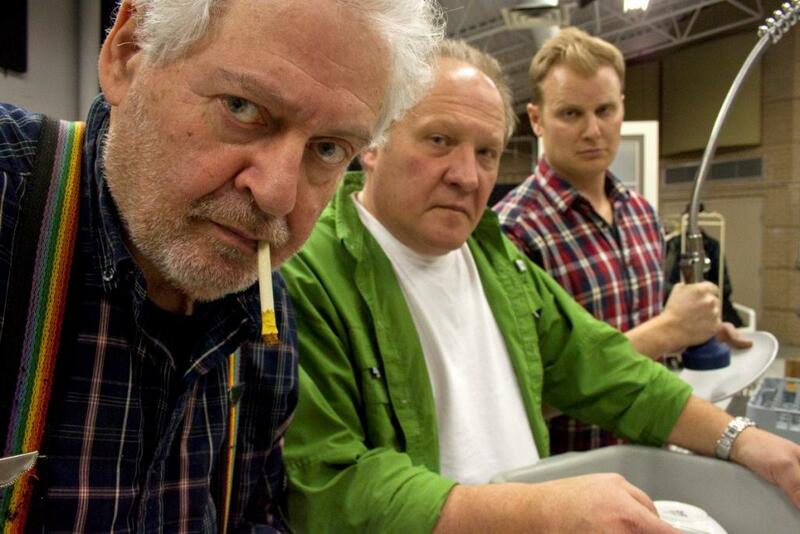 The Dishwashers runs January 23 to February 10. Tickets and details at www.pte.mb.ca. Wilkie: Ambition is a dream you wake up from in the last moment of your life. Anniko: As you grow older your dreams become smaller. They won’t even be dreams anymore, just little wishes. Nelken: Don’t let go of the rope!